"BGEA: What is a cult?" The above is the archived page. It used to be on the Billy Graham Evangelistic Association website. It says unequivocally that Mormonism is a cult. Try searching for this page now, and you get "Our apologies, but the article you requested doesn't exist." But through the miracle of "nothing ever goes away permanently on the Web," it is still retrievable. And you can read Billy Graham's opinion from Wednesday that Mormonism is a cult "which teaches doctrines or beliefs that deviate from the biblical message of the Christian faith." 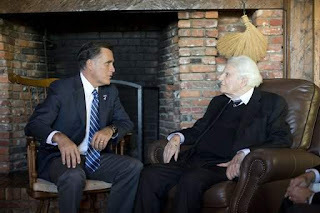 Billy Graham met with Mitt Romney on Thursday in Montreat, NC, and told him that he wanted to do "all I can" to see him elected president. All previous statements are now inoperable.